First, line your muffins tins and make your homemade chocolate. To make a large batch I would start by mixing together 1 cup cocoa powder, 1/3 cup coconut oil or cocoa butter (melted), 1/3 cup or less maple syrup. Add a pinch of sea salt and a dash of vanilla extract. If you find you need more chocolate for the almond butter cups just make another batch using the correct ratios, and store leftovers in the fridge. **For a quicker route, just melt about a pound of dark chocolate in a double boiler setup so that it liquifies and stirs easily. Now, make the caramel filling in a separate bowl. Combine 1/4 cup smooth, unsalted almond butter, 2 tablespoons maple syrup, 1 1/2 tablespoons of melted coconut oil, 1 tablespoon of arrowroot, and 1/2 teaspoon of vanilla extract. Set aside. Combine the almond butter, arrowroot powder, maple syrup, vanilla extract, almond extract, and salt until combined and set aside. Spoon a little less than a tablespoon of chocolate into a regular sized muffin tin. Use a utensil to smother the chocolate so it covers the bottom entirely. Repeat until all tins have chocolate at the bottom. Spoon a small teaspoon of caramel sauce on top of each chocolate puddle. Then scoop out a heaping teaspoon of almond butter filling and roll into a ball. Press down on top of each chocolate/caramel puddle in the muffin tins. Repeat with all tins. 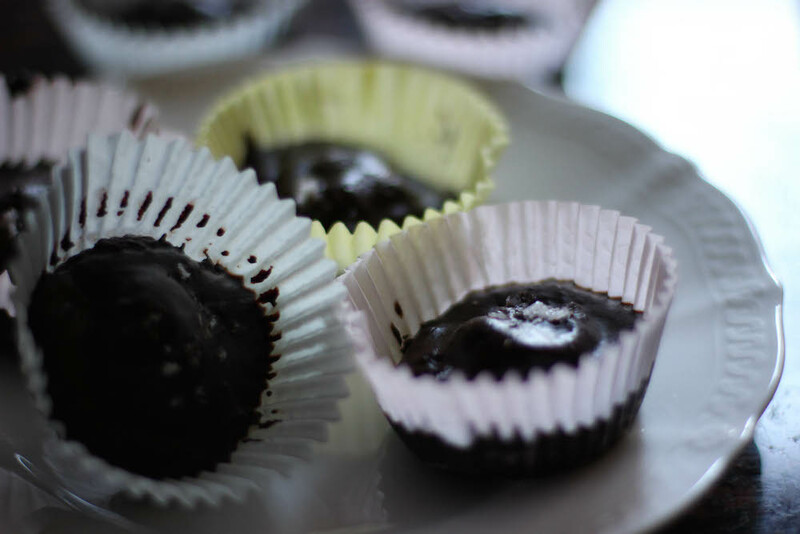 Spoon a little less than one tablespoon of chocolate mixture onto the top of each almond butter ball to cover it completely. You can use your finger to maneuver the chocolate -if it is messy, no worries (isn’t that the fun of it?)! Sprinkle a pinch of flaked sea salt on each almond butter cup and chill in the fridge until they are set. *Store in the fridge. If you made coconut oil based chocolate, store in the fridge until RIGHT before you eat them for the best texture results! 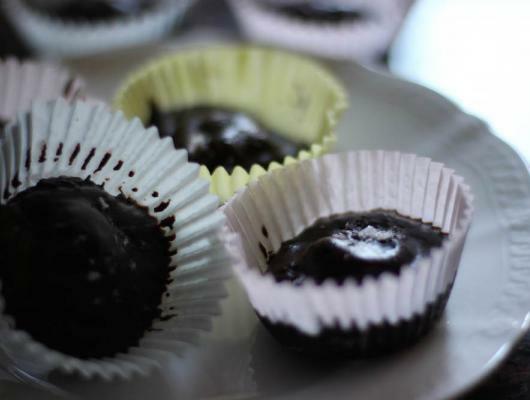 Gluten Free, Vegan, Raw Dark Chocolate Almond Butter Cups made with all healthy ingredients and natural sweetener.